You look like a teenager wearing this combo! You're simply radiant! The skirt is eye catching! I like every piece of this outfit and the entire look! splendido look!! ti sta molto bene!! Oh, you look absolutely radiant in this outfit, Lilli! I especially love the skirt, it looks really good on you and the details on it is really good. Wishing you a great weekend, Lilli! You look very lovely Lilli, what a professional and stylish outfit. I love that scarf. Wishing you a fabulous weekend. You look so chic in this outfit Lilli! Happy May Day! I love May too because it's my birthday's month! Love your scarf and your skirt!So stylish! Here we are wairing Summer cloths! It's getting hot these days! You look gorgeous, Love the colors, accessories, make up.. everything about this look! Many kisses Lilli! Have a great weekend!!! Adoro la gonna e tu sei sempre chic Lilli! Baci. Beautiful beautiful look cara mio!! Hello chic lady. Happy May to you and don't you look so pretty! I love the outfit and the month of May is my favorite as well. My allergies don't like it so much though. Have a wonderful weekend sweet Lilli! Lilly a me in gonna piaci da morire, questa poi ha un colore bellissimo. Hi Lilli, you look very nice, loving you make up. Well you picked the perfect pairing of colors lilli! So uplifting! Love the shades of pink. Gorgeous scarf. Che chic che sei!!! Questa mini ti sta benissimo e il tocco lady-like del foulard in seta è molto raffinato!!! Over the top il make-up!!!! Happy May day Lilli; lovely outfit. I like the pop of color in the skirt and the lovely clutch and scarf. It is starting to warm up over here in Minnesota. Yes, May will be a lovely and positive month. You look great. I like the way you wear your scarf for Spring! Have a wonderful weekend! PS I've decided to write you in English due to my feeling that I really forgot my Italian :P You can still write in Italian on my blog (I understand everything but I'm not so secure when speaking and writing)! You look stunning, pretty Lilly, especially in the first two and last picture. Have a wonderful weedend. Happy May to you Lilli. May it be as fabulous as you are. Especially in this scarf. I love the Italian vintage feel. (Italian vintage is something I call when it reminds me of Luxury, Italy, Sophia Loren and Dolce & Gabbana. It probably makes no sense to you though hahaha!) Don't mind my craziness. 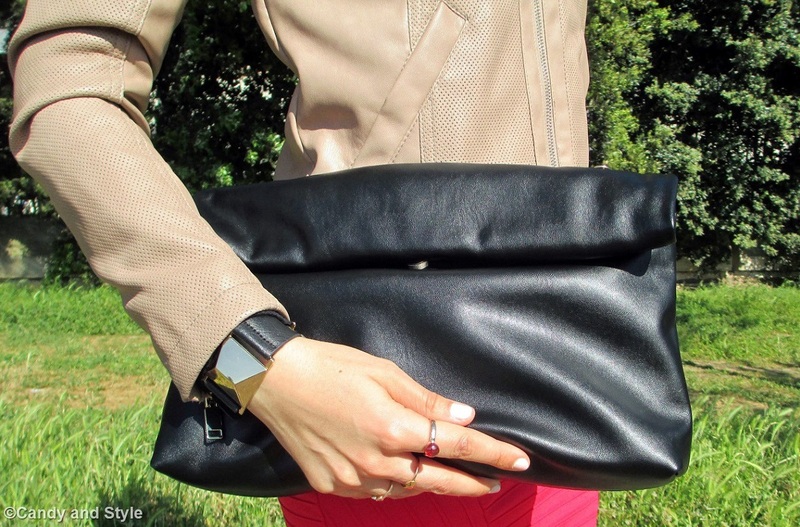 The scarf and the clutch are my favourite elements of this look! adoro le sciarpe...sono un accessorio perfetto! Mi piace moltissimo il tuo look...bellissima la gonna...molto femminile! sei divina! Your pink skirt looks very very nice! Good look. mi piace tantissimo la sciarpina in seta, è il tocco in più! poi un giorno mi devi spiegare come fai a mettere così bene l'eyeliner! io sono una frana! 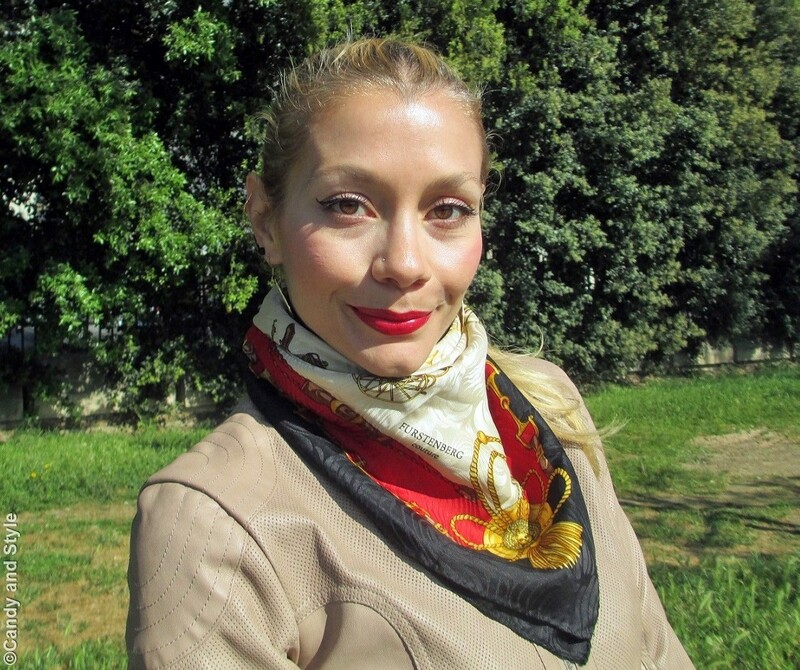 Molto bello questo look, il foulard da un vero tocco di classe! Ciao Lilli. Anch'io in genere amo questo mese ma con il tempo di queste ultime settimane sembra di essere ancora in inverno!! Molto carino questo look. Mi piace molto la giacca. Great skirt and booties, hun! belli i colori di questo look!